I have seen various developments and changes within counselling profession over the last 15 years. More courses are available, British Association of Counselling and Psychotherapy (BACP) membership has vastly increased and more counsellors are becoming private practitioners. Counsellors and organisations have to market themselves and approach their counselling work with a business head. Online counselling has grown with many counsellors now providing this along their face to face work. We have seen the increase of social media and people having the confidence to voice their opinions. This in turn has meant counselling is becoming more popular and slowly breaking down the taboo of mental health. The merits of swapping membership (BACP) with National Counselling Society (NCS) membership. What are the changes that have lead to these two questions? As I mention in my article about regulation, when I was a student we often talked about it in our lessons and I remember I was one of the few trainees that in principle supported the idea of regulation. How and what form that should take, I wasn’t sure (and I’m still not!). One of the main arguments against formal regulation was that my peers felt regulation would not necessarily stop client abuse. Additionally regulation implies medical values which came be seen as opposing the rich varied use of counselling and psychotherapy approaches. However, one thing we all agree on is that our clients do need protecting. The debate on regulation continues. Instead of regulation there has been the development of the Accredited Register (formerly known as the Accredited Voluntary Register). The Register was set up by the Department of Health to ensure that the public are able to choose safe, ethical, adept professionals for their health and social care needs. Both NCS and BACP have had its register of Accredited Counsellors accredited by the Professional Standards Authority. Memberships to these two bodies have different routes with (in my opinion) the BACP’s route being more rigorous. As Philip Dore writes about in his website unsafe spaces, this accredited register isn’t necessarily robust. Counsellors struck off from the BACP register due to client abuse are still practising. If the word counsellor or psychotherapist was protected, would it stop abuse? Back in 1999 the National Counselling Society (NCS) was formed. It was set up by a group of counsellors and psychotherapists who found BACP wasn’t serving their needs. What is the difference between BACP and NCS? The question that needs to be explored is whether these routes into membership be similar? 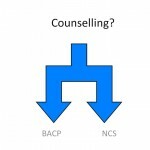 Presently with BACP you need to actively demonstrate your counselling work but NCS you don’t. NCS membership is cheaper than BACP. Price should not drive professionalism but for some maybe it does. Counsellors feel accreditation does not show you are a good counsellor. You can be experienced without it. It is true you can be a good counsellor without accreditation status but I feel accreditation gives you creditability. I see my accreditation the same as my husband’s chartered engineer status. Many engineers can have the title engineer without being chartered but when you see one is chartered you know they have been examined and recognised by their engineering body. Trust is instantly built. For me, BACP accreditation says the same to the public. My own BACP Accreditation gave me a greater insight into myself and my role as a counsellor and I am thankful I took the time to complete it. Split in the Counselling professionalism? It feels as though there is beginning to be a split in the profession and I find this sad. We all want to protect our clients, promote their autonomy and help them. In the meantime I will stay a BACP member and adhere to their framework. The debate on regulation will continue. In the meantime I feel it is up to us and other mental health workers to raise the awareness to the public of the Register, so that clients can make the right choice in counsellor for them and know what credentials to look out for. What are your views, so you want regulation?